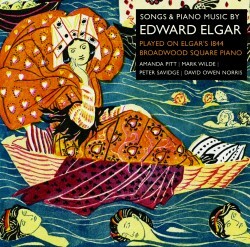 A tribute to Elgar’s 150th birthday (2007), David Owen Norris and The Works perform Elgar’s songs and piano solos on Elgar’s own 1844 Broadwood piano, including the world-premiere of his unpublished final song XTC, set to his own words. In all, this 2-CD set presents 32 of Elgar’s finest songs for voice and piano, including a number never recorded before, and premiere recordings of Elgar’s piano arrangements of the theme of the Cello Concerto, and the Prelude and Angel’s Farewell from Gerontius which, like Sea Pictures (sung here in its original soprano key) and the Woodland Interlude from Caractacus, were all composed at this piano. He even wrote these titles on its soundboard, along with his signature. These piano versions clearly remained in the forefront of Elgar’s mind and reveal his bold first thoughts before they may have been revised at the suggestion of others. The piano’s construction – keys slightly narrower than on a modern piano, the black keys set lower – illuminates Elgar’s intentions. The writing suddenly makes perfect sense, which it doesn’t always on a modern Steinway. The cover art is H.A. Payne’s The Enchanted Sea, which was part of the inspiration for Sea Pictures. The booklet, meticulously annotated by Owen Norris, includes complete song texts. 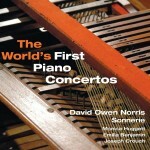 An inquisitive and acclaimed Elgar performer, Owen Norris is the only pianist to have recorded the complete solo piano works of Elgar, as well as the reconstruction of Elgar’s Piano Concerto which he has performed throughout Europe and North America.